The deal, announced on Tuesday afternoon, will see Tongfang Kontafarma – a Chinese company indirectly invested by Tsinghua University that primarily manufactures and sells prescription drugs – take a 51 per cent stake in True’s Singapore and China businesses, as well as a 29 per cent stake in its Taiwan operations. The company’s founder and group chief executive officer Patrick Wee said the new partnership with Tongfang Kontafarma will see the opening of more than 20 new clubs in various tier-one and tier-two cities in China by end-2019. 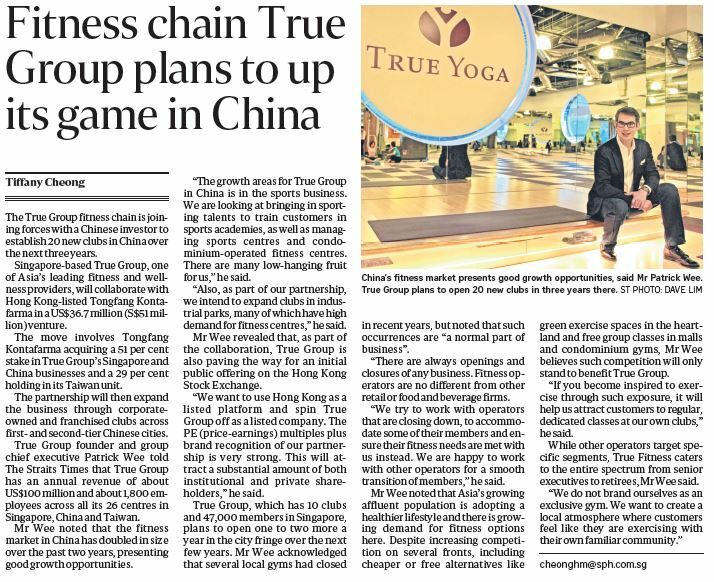 In an interview with The Business Times, Mr Wee said True will grow its footprint in the fitness and yoga business through corporate-owned and franchised clubs across the world’s second-largest economy. The expansion plans involve an injection of an initial US$5 million in cash into the business to help fuel the growth of this franchised model in China. True already runs two branches in China, both in the city of Xiamen in southeastern Fujian province. Mr Wee said he now has his eyes on the main cities such as Shanghai and Beijing, and other larger cities in the western part of the country. “China, in the last two-and-a-half years, has seen an absolute explosion in terms of the interest in fitness. The number of large-scale fitness centres has almost doubled there, but still everything is relative for a country of 1.2 billion people,” he said. According to latest figures from the China Business Research Academy, the number of gym memberships in China has doubled since 2008 to 6.6 million in 2016. Last year, the Chinese government approved a new national fitness plan that has ambitious targets for national fitness levels and increased sports participation. Overall, the booming health, fitness and leisure industry in China is expected to be worth some 3 trillion yuan (S$607.4 billion) by 2025. “China has a lot of low-hanging fruit, so the opportunities abound for us not just in terms of opening clubs in greenfield sites (shopping centres or standalone locations). We also think we can take over and manage sports facilities in residential properties,” said Mr Wee. “We are also looking at acquisitions of existing gym operators in China, and we’re in talks with some country club-style facilities that want us to come in and professionally manage them,” he added. On the potential of the company going public in Hong Kong, Mr Wee said he was excited about the opportunity, which he feels could materialize some time in the next two years. “The Hong Kong Stock Exchange is an exciting one. Tsinghua University has a strong brand – institutional investors and private investors in China and Hong Kong know the brand,” he said. On whether he would consider an IPO in Singapore, he said this still remains an option, although the final call would be driven by True’s Chinese partners given the fact that they are “much more familiar” with the Hong Kong Stock Exchange. Mr Wee, a 53-year-old lawyer by training, launched True Group in Singapore 13 years ago in 2004. There are over 110,000 members, with around 47,000 of them in Singapore. True will open its ninth facility in Singapore – an 18,000 sq ft True Fitness – at Viva Business Park along Chai Chee Road next Monday. The True Group fitness chain is joining forces with a Chinese investor to establish 20 new clubs in China over the next three years. Singapore-based True Group, one of Asia's leading fitness and wellness providers, will collaborate with Hong Kong-listed Tongfang Kontafarma in a US$36.7 million (S$51 million) venture. The move involves Tongfang Kontafarma acquiring a 51 per cent stake in True Group's Singapore and China businesses and a 29 per cent holding in its Taiwan unit. The partnership will then expand the business through corporate- owned and franchised clubs across first- and second-tier Chinese cities. True Group founder and group chief executive Patrick Wee told The Straits Times that True Group has an annual revenue of about US$100 million and about 1,800 employees across all its 26 centres in Singapore, China and Taiwan. Mr Wee noted that the fitness market in China has doubled in size over the past two years, presenting good growth opportunities. 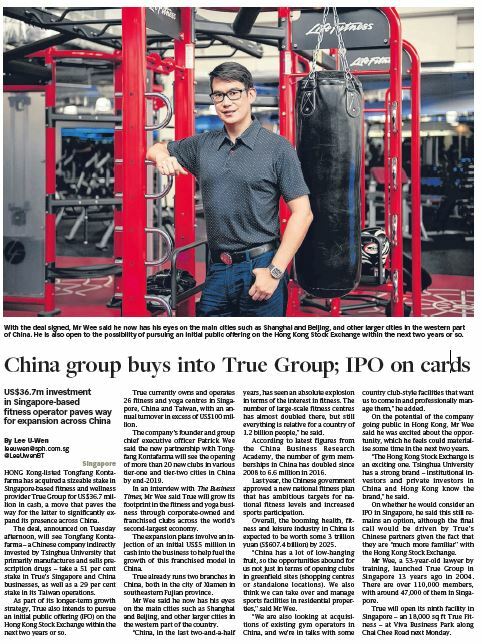 "The growth areas for True Group in China is in the sports business. We are looking at bringing in sporting talents to train customers in sports academies, as well as managing sports centres and condominium-operated fitness centres. There are many low-hanging fruit for us," he said. "Also, as part of our partnership, we intend to expand clubs in industrial parks, many of which have high demand for fitness centres," he said. Mr Wee revealed that, as part of the collaboration, True Group is also paving the way for an initial public offering on the Hong Kong Stock Exchange. "We want to use Hong Kong as a listed platform and spin True Group off as a listed company. The PE (price-earnings) multiples plus brand recognition of our partnership is very strong. This will attract a substantial amount of both institutional and private shareholders," he said. True Group, which has 10 clubs and 47,000 members in Singapore, plans to open one to two more a year in the city fringe over the next few years. Mr Wee acknowledged that several local gyms had closed in recent years, but noted that such occurrences are "a normal part of business". "There are always openings and closures of any business. Fitness operators are no different from other retail or food and beverage firms. "We try to work with operators that are closing down, to accommodate some of their members and ensure their fitness needs are met with us instead. We are happy to work with other operators for a smooth transition of members," he said. Mr Wee noted that Asia's growing affluent population is adopting a healthier lifestyle and there is growing demand for fitness options here. Despite increasing competition on several fronts, including cheaper or free alternatives like green exercise spaces in the heartland and free group classes in malls and condominium gyms, Mr Wee believes such competition will only stand to benefit True Group. "If you become inspired to exercise through such exposure, it will help us attract customers to regular, dedicated classes at our own clubs," he said. While other operators target specific segments, True Fitness caters to the entire spectrum from senior executives to retirees, Mr Wee said. "We do not brand ourselves as an exclusive gym. We want to create a local atmosphere where customers feel like they are exercising with their own familiar community."